This article is about Jean-Jacques Rousseau's 1762 treatise. For "social contract" as a political and philosophical concept, see Social contract. For other uses, see Social Contract (disambiguation). The Social Contract, or Of the Social Contract, or Principles of Political Right (French: Du contrat social ou Principes du droit politique; 1762) by Jean-Jacques Rousseau, is a book in which Rousseau theorized about the best way to establish a political community in the face of the problems of commercial society, which he had already identified in his Discourse on Inequality (1754). Title page of a pirated edition of the Social Contract, probably printed in Germany. The stated aim of The Social Contract is to determine whether there can be a legitimate political authority, since people's interactions he saw at his time seemed to put them in a state far worse than the good one they were at in the state of nature, even though living in isolation. He concludes book one, chapter three with, "Let us then admit that force does not create right, and that we are obliged to obey only legitimate powers", which is to say, the ability to coerce is not a legitimate power, and there is no rightful duty to submit to it. A state has no right to enslave a conquered people. In this desired social contract, everyone will be free because they all forfeit the same amount of rights and impose the same duties on all. 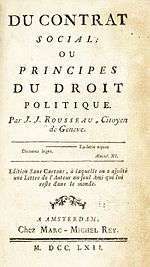 Rousseau argues that it is absurd for a man to surrender his freedom for slavery; thus, the participants must have a right to choose the laws under which they live. Although the contract imposes new laws, including those safeguarding and regulating property, there are restrictions on how that property can be legitimately claimed. His example with land includes three conditions; that the land be uninhabited, that the owner claims only what is needed for subsistence, and that labor and cultivation give the possession legitimacy. Rousseau posits that the political aspects of a society should be divided into two parts. First, there must be a sovereign consisting of the whole population, women included, that represents the general will and is the legislative power within the state. The second division is that of the government, being distinct from the sovereign. This division is necessary because the sovereign cannot deal with particular matters like applications of the law. Doing so would undermine its generality, and therefore damage its legitimacy. Thus, government must remain a separate institution from the sovereign body. When the government exceeds the boundaries set in place by the people, it is the mission of the people to abolish such government, and begin anew. Rousseau claims that the size of the territory to be governed often decides the nature of the government. Since a government is only as strong as the people, and this strength is absolute, the larger the territory, the more strength the government must be able to exert over the populace. In his view, a monarchical government is able to wield the most power over the people since it has to devote less power to itself, while a democracy the least. In general, the larger the bureaucracy, the more power required for government discipline. Normally, this relationship requires the state to be an aristocracy or monarchy. It is important to note here that when Rousseau talks of aristocracy and monarchy, he does not necessarily mean they are not a "democracy" as the term is used in the present day — the aristocracy or monarch could be elected. 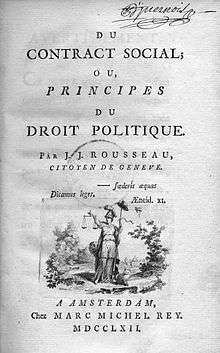 When Rousseau uses the word democracy, he refers to a direct democracy rather than a representative democracy. In light of the relation between population size and governmental structure, Rousseau argues that, like his native Geneva, small city-states are the form of nation in which freedom can best flourish. For states of this size, an elected aristocracy is preferable, and in very large states a benevolent monarch; but even monarchical rule, to be legitimate, must be subordinate to the sovereign rule of law. The French philosopher Voltaire used his publications to criticise and mock Rousseau, but also to defend free expression. In his Idées républicaines (1765), he reacted to the news that The Social Contract had been burned in Geneva, saying "The operation of burning it was perhaps as odious as that of writing it. [...] To burn a book of argument is to say: 'We do not have enough wit to reply to it.'" ↑ R.A. Leigh, Unsolved Problems in the Bibliography of J.-J. Rousseau (Cambridge, 1990), plate 22. ↑ Gay, Peter (1959). Voltaire's Politics: The Poet as Realist. New Jersey: Princeton University Press. pp. 214–219. ↑ Davidson, Ian (2004). Voltaire in Exile. Atlantic books. pp. 186–187. ISBN 1843540878. Bertram, Christopher (2003). Rousseau and the 'Social Contract'. Routledge. Williams, David Lay (2014). Rousseau's 'Social Contract': An Introduction. Cambridge University Press. Wraight, Christopher D. (2008). Rousseau's The Social Contract: A Reader's Guide. London: Continuum Books. Wikimedia Commons has media related to Du contrat social. Catholic Encyclopedia Based on an article critical of The Social Contract, written in 1908.